The Surface Pro in all its Studio-mode glory. 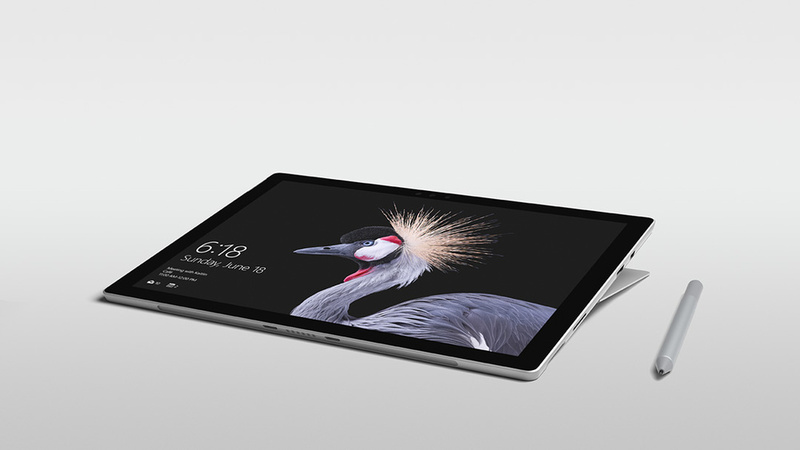 At a special event held in Shanghai back in May, Microsoft unveiled the fifth-generation Surface Pro — the first Surface Pro to lack a numerical appendage since the original model debuted five years ago. The new Surface Pro is more refinement than revolution, looking basically the same as the Surface Pro 4 that preceded it, not that this is a bad thing. The Surface Pro’s design could hardly be accused of becoming stale; it retains a slick, modern appearance, especially when coupled with a Signature Type Cover. The new Surface Pro benefits from many of the lessons the Surface team learnt whilst developing the Surface Studio. One example of this is that the angle to which the kickstand can be extended has increased from 150 to 165 degrees. And while you might not think 15 degrees would mean that much, it makes the Surface Pro far more pleasant to use in what Microsoft term as ‘Studio’ mode, especially, when working with StaffPad or Sibelius, or with DJ apps like djay Pro. Another example is that the display has an enhanced colour space, making everything appear a little more vividly than before. Finally, the magnetic strength on the left side of the device for stowing the Surface Pen has also increased so that the Pen is less likely to become separated unintentionally. Setting up the new Surface Pro was possibly the best experience I’ve ever had getting Windows up and running. The procedure seemed quicker and smoother, with Cortana greeting you to explain how she can assist in the installation with the aid of your vocal beckoning. She can be silenced if you would be so cruel, but I found the experience rather charming. Setting up Windows has never been so much fun. As before, many Surface Pro configurations are available, powered by either an Intel m3, i5, or i7 processor. The improved thermal performance of Intel’s ‘Kaby Lake’ micro architecture has allowed Microsoft to make not just m3-based Surface Pros fan-less, as with the Pro 4, but also the i5-based models. This is a big deal. One thing that always annoyed me with previous Surface Pros was the fan, which seemed to have a mind of its own, spinning up even when Windows was seemingly idle. 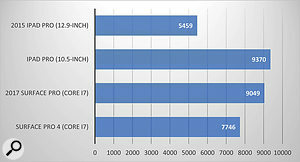 I had an i7 model for review and was immediately struck by how quiet it was compared to my Core i7-based Surface Pro 4. It’s pretty much silent in basic use, and the fan is noticeably less obtrusive when employed. The new Surface Pro features the same connectivity as the Surface Pro 4: a USB 3 connector, Mini DisplayPort, a headphone jack, and a Surface Connect port — not forgetting the useful microSD slot behind the kickstand that can be used to upgrade the storage available to the device. The lack of Thunderbolt support, either via the Mini DisplayPort or a USB-C connector, is perhaps a little disappointing in a modern, self-described ‘Pro’ device, since it limits your ability to connect Thunderbolt audio devices or fast external storage. That said, there’s no shortage of professional USB 3-based audio equipment, such as RME’s Fireface UFX or MADIface XT interfaces, for example. In addition to offering three processor configurations, there are also various storage and memory tiers. The m3-based Surface Pro has 4GB memory and 128GB storage for £799$799, while the i5 model can be ordered with either 4GB/128GB or 8GB/256GB for £979$999 and £1249$1299 respectively. Three i7 configurations are available: 8GB/256GB for £1549$1599, 16GB/512GB at £2149$2199, and 16GB/1TB, which is priced at £2699$2699. This line-up means that the Surface Pro competes with different devices depending on how much you spend. At the lower end, the competition is clearly the iPad Pro; here, the m3-based Surface Pro costs a little more, offering more storage, but with less performance. And as you move up the range, you get into MacBook Air and then MacBook Pro territory, not to mention the myriad Windows-based alternatives. 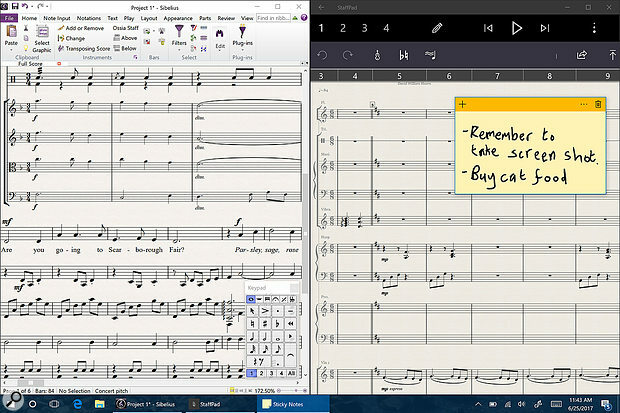 The Surface Pro is the only mobile device that can run desktop applications like Sibelius and apps like StaffPad side by side, both with support for the Surface Pen. In addition to a new Surface Pro, Microsoft also introduced a new Surface Pen that’s available in four different colours: the traditional Platinum, along with Burgundy, Cobalt Blue and Black. The new Pen loses the clip, which I found a bit sad, but now recognises 4096 pressure levels with tilt sensitivity. The new Pen is backwardly compatible with all Surface models since the Surface Pro 3, including the Surface 3, Book, and Studio, although only the new Surface Pro supports tilt at the time of writing. At the launch Microsoft boasted that, when used with the new Surface Pro, this was the most responsive pen available with a latency of just 21ms. This honour was passed to Apple’s new iPad Pro models a month later, with the company claiming a latency of 20ms when using an Apple Pencil. I think you’d be hard-pushed to notice a difference. Combined with the increased support for Ink in Windows, the new Surface Pro offers the best Surface Pen experience yet, arguably fulfilling Microsoft’s vision for Tablet PCs from 16 years ago. However, I do have one gripe with the Surface Pen: for the first time with a Pro Surface model, it’s not included in the box. Microsoft say this is because many people will be upgrading from previous models and therefore already have a Pen (older Pens still work on the new Surface Pro), and not everyone uses the Pen in any case. However, I’m sure cost is also a factor; the new Pen is now priced the same as Apple’s Pencil at £99.99$99.99 — the previous Pen cost £59.99$59.99. As well as a new Pen, Microsoft also have new Type Cover options. The company had previously released a ‘Signature’ Type Cover made from Alcantara fabric, and there are now further colour options priced at £149.99$159.99. The new refined Signature Type Cover is simply gorgeous (I had the Platinum model) and feels amazing to type on, with an improved 1.3mm key travel along with an eminently-usable ‘Precision’ trackpad. In fact, I’d go as far to say that this is the first Type Cover — which I happen to be using to enter these words — that doesn’t feel like a compromise. 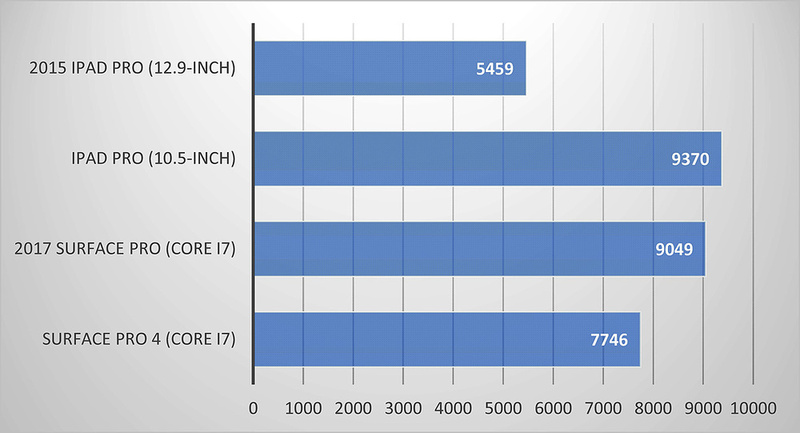 Here you can see how the new Surface Pro compares with the previous models and the competition, based on Geekbench 4 multi-core scores.The new Surface Pro also supports the Surface Dial, which was reviewed in the April issue. And while the Dial is compatible with any Bluetooth-LE-capable Windows 10 PC, until now only the Surface Studio could recognise the Dial when it was placed on the screen. This functionality is now available on the new Surface Pro, and it’s nice to have, even though it’s perhaps less useful on systems with smaller screens. That said, however, I did take the Surface Pro running djay Pro, along with a Dial, to show a friend at a local club. Despite him being very much of the vinyl persuasion (and very much against virtual alternatives), he immediately got how the Dial could offer the best of both worlds. And when you see the two devices together, with the Surface Pro in Studio mode, you’re perhaps looking at the most mobile, DJ-friendly setup available. The Windows Store remains depressingly app-deficient when it comes to music creation and audio production. But the important thing to remember is that the Surface Pro can run both traditional Windows desktop apps like Cubase, Live and Reason, as well as the Universal Windows Platform (UWP) apps available on the Store. And on the desktop side, companies like Bitwig have added touch support to the company’s eponymous product with the Surface range very much in mind. It perhaps goes without saying that the fifth-generation Surface Pro is the best Pro Surface Microsoft have ever created. But, more importantly, it feels like this is the Surface Pro Microsoft always wanted to create. It is almost certainly the best mobile device for working with notation, as well as being a promising device for DJ’ing, and it’s also a highly portable way of running existing music and audio applications.